PT Prima Multi Terminal - PT PMT is a reputable port services company in Indonesia that is involved in integrated Port Developer. 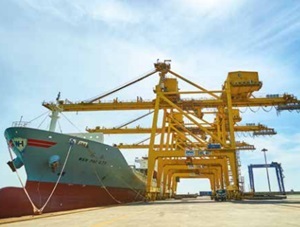 PT PMT has business focuses on Ports and Operators Development. PT Prima Multi Terminal operates primarily as a multi-purpose terminal that manages container terminal and bulk liquid terminal especially for palm oil commodity (CPO) and its derivative. The business areas of PT Prima Multi terminal are International and Domestic Container Terminal, International and Domestic Liquid Terminal Terminal, Warehousing Provision, certain Industry Activities, and other Supporting Services. PT PMT is a directly owned subsidiary of state-owned port operator PT Pelabuhan Indonesia I (Persero) or Pelindo 1 Group. According to information found in PT PMT's website as cited by JobsCDC.com, Pelindo 1 Group hold 55% shares in PT PMT. Other remaining shares in PT PMT was owned by PT Waskita Karya (Persero) Tbk (20%) and PT Pembangunan Perumahan (Persero) Tbk (25%). PT PMT now developing new multipurpose terminal at Port of Kuala Tanjung in Batubara North Sumatera. Minimum 5 years of relevant work experience in HRD. Fluent in English, both oral and written (Score TOEFL min 350). Minimum 2 years of relevant work experience in general affair or office administration. Good looking and polite with minimum height of 155 cm (proportional). Must attach a full body photo. D3 Secretary, Economics, Office Administration, Communication, Tourism with minimum GPA of 2.75 (Accreditation A) or 3.00 (Accreditation B). Minimum 2 years of relevant work experience. The candidates with prior experience as an Auditor is preferred. Computer literate (Word, Excel, Power Point). Possess certification in Tax Brevet A and B is preferred. Minimum SMK/STM with minimum average national exam score of 7.5. Minimum 2 years of relevant work experience in port. S1 Mechanical Engineering, Electrical Engineering, Industrial Engineering with minimum GPA of 2.75 (Accreditation A) or 3.00 (Accreditation B). Minimum 3 years of relevant work experience. Have experience in the construction or maintenance of port / factory / port equipment or heavy equipment installation. Computer literate (Ms. Office and AutoCAD). D3 Electricity Engineering, Electrical Engineering, Instrumentation Engineering with minimum GPA of 2.75 (Accreditation A) or 3.00 (Accreditation B). The candidates with prior experience in electrical installation and distribution and maintenance of power grids is preferred. The candidates with prior experience in CPO and port industry is preferred. D3 Mechanical Engineering, Industrial Engineering, Energy Engineering with minimum GPA of 2.75 (Accreditation A) or 3.00 (Accreditation B). The candidates with prior experience in electrical installation and distribution and maintenance of power grid is preferred. D3 Economics, Informatics, Electrical, Mechanical, Automotive, Industrial with minimum GPA of 2.75 (Accreditation A) or 3.00 (Accreditation B). The candidates with prior experience as warehouse admin i manufacturing industry or Admin Infrastructure Project is preferred. Minimum SMK/STM Mechanical with minimum average national exam score of 7.5. Minimum 2 years of relevant work experience in handling Industrial / factory / Port equipment. Minimum SMK/STM Electricity, Electrical with minimum average national exam score of 7.5. Minimum 2 years of relevant work experience in handling electrical installation on Industrial / Factory / Ports / Generator. Minimum 2 years of relevant work experience in handling electrical / instrumentation installation. D4/S1 Port Management, Shipping Engineering, Marine Engineering, Logistics Management or S2 Port with minimum GPA of 2.75 (Accreditation A) or 3.00 (Accreditation B). Solid understanding of port operational pattern. D3/D4/S1 Nautika, Port Management, Engineering with minimum GPA of 2.75 (Accreditation A) or 3.00 (Accreditation B), preferably fro PTN/PTS accreditation A. Minimum 3 years of relevant work experience in port/shipping/logistics. Able to analyze detail of ship operation and container yard. Able to analyze detail of ship operation. D3/D4 Nautika, Port Management, Engineering with minimum GPA of 2.75 (Accreditation A) or 3.00 (Accreditation B), preferably fro PTN/PTS accreditation A. Able to analyze detail of container yard operation. Able to read the planning of B / M Ship operations. Have a good communication with Related Institution and Service User. Able to analyze detail of ship operations and liquid bulk terminals. D3/D4 Nautika, Marketing, Management, Transportation with minimum GPA of 2.75 (Accreditation A) or 3.00 (Accreditation B), preferably fro PTN/PTS accreditation A. Able to analyze and evaluate detailed traffic, production and revenue of terminal services. SMA/SMK IPA/IPS/Marketing or D1 Secretary minimum average national exam score of 7.5. Minimum 1 year of relevant work experience in port/shipping/logistics. SMA/SMK with minimum average national exam score of 7.0. Possess driving license class B2 Umum (SIM B2 Umum) is preferred. Preferably have in driving head Truck for minimum 2 years. JobsCDC.com now available on android device. Download now on Google Play here. Please be aware of recruitment fraud. The entire stage of this selection process is free of charge. PT Prima Multi Terminal - SMA, SMK, D3, S1 Staff, Supervisor Pelindo I Group March 2018 will never ask for fees or upfront payments for any purposes during the recruitment process such as transportation and accommodation.